Stanton Welch seems to be on his best behavior this year. While his 2003 dance for the San Francisco Ballet, Tu Tu, showed a jokey, irreverent voice as a choreographer, this year&#146;s piece, Falling, his fourth for the company, is almost, but not quiet, mannerly. Exploring two of Mozart&#146;s divertimenti from the Salzburg Symphonies, Welch&#146;s classical foray seems just right with the lightness and speed of the score, well-delivered by conductor Gary Sheldon and members of the orchestra. 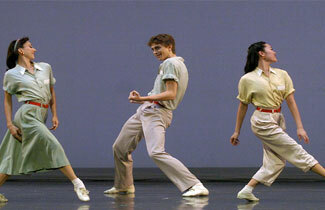 The dance is for five couples, but redistributions of these partnerships created memorable solos and trios. Kristin Long even had a long, lovely interlude between musical sections in silence. Of the duets, Tina LeBlanc and Gonzalo Garcia made a particularly strong impression.Welch created phrases for the two which were rapid journeys over and around each other&#146;s bodies,replacing the usual emphasis on steps and moving out with sequences that revolved. Much use is made of the upstage wall, where dancers continually entered and exited through slots in the curtain, travelling in a straight shot out of the darkness. The whole dance has this sense of fresh direction and confident musicality. Only an occasional bobbing head or quirky arm gesture reminded that this is the same Welch who delivered the campier Tu Tu. Falling, is a delight in shades of pastel,with good ideas and excellent dancing delivered in a joyful, Mozartian spirit. Mark Morris&#146; 1994 piece for the company, Maelstrom, which preceded Welch&#146;s premiere on the program, is earthier, rounder.The Morris work, to Beethoven&#146;s Trio in D Major, Opus 70 ("Ghost"), is like a landscape painting with bodies, a storm that is long in brewing. Between the tilts, flexed feet and wine-colored dresses, there is much in the piece that suggests the somber modern dance of the 1940&#146;s. Morris&#146; world is an egalitarian one,with squadrons of dancers moving across stage making arm gestures. The rapturous delight the choreographer is perhaps most celebrated for delivering in some of his most famous works is absent here. Company B, the Andrews Sisters paean by Paul Taylor, looks less like a marketing decision and more like artistic brilliance when it is danced as clearly and lovingly as it is by the San Francisco company.From the opening crossovers, with the softest, subtlest foot-tapping and bodies in silhouette (the excellent lighting was by Jennifer Tipton) the piece manages to capture, at the same time, the innocence of the World War II era, along with the horrors of that particular war. Taylor is an artist who knows how to weave narrative through a work in such interesting and subtle ways that most ballet choreographers could take a lesson. This is a crowd-pleaser that is far from trite. The ensemble uses the floor like real modern dancers, but create lines and clarity Taylor&#146;s own dancers can&#146;t compete with. Lorena Feijoo almost manages to blend in in her khaki skirt until her moment to shine in &#147;Rum and Coca-Cola.&#148; Here,Cuban pride and Latin sexiness blend with the prima ballerina qualities we&#146;re accustomed to, making for a delicious dance cocktail. Another interesting cultural juxtaposition is watching Russian dancer Guennadi Nedviguine cut a rug as the &#147;Boogie Woogie Bugle Boy (of Company B).&#148; Pascal Molat offers a funny &#147;Tico-Tico.&#148; Sarah Van Patten a nostalgic &#147;I Can Dream, Can&#146;t I?,&#148; and &#147;There Will Never Be Another You&#148; was danced with poignancy by Courtney Elizabeth and Moises Martin.